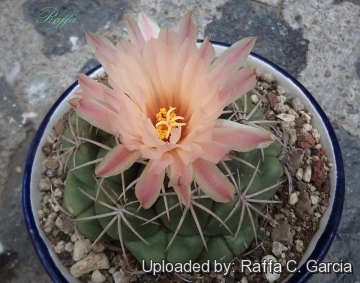 Origin and Habitat: Coryphantha elephantidens is endemic to Mexico where it is known to occur in the states of Aguascalientes, Guerrero, Guanajuato, Hidalgo, Jalisco, México, Michoacán, Morelos, Oaxaca, Puebla, Querétaro, Veracruz and Zacatecas. The subsp. greenwoodii has a restricted range near Piedras Blancas, Veracruz. Subsp.bumamma is recorded from the States of Oaxaca and Michoacán. Altitude: 1100-2000 metres above sea level. 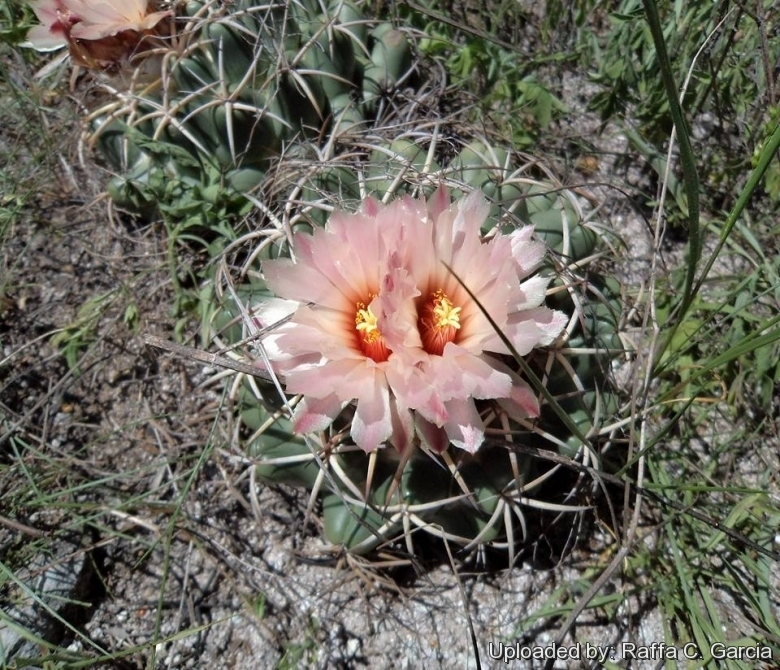 Habitat and Ecology: Coryphantha elephantidens is found in grasslands and xerophyllous scrub. It is widespread and relatively common and is threatened by deforestation from small-holder agriculture and cattle ranching. 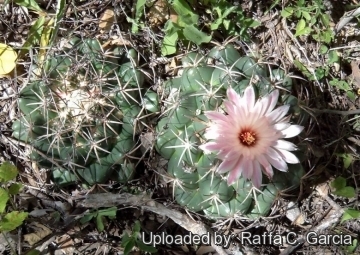 In the same area it is possible to find several cactus and succulent species like: together with Mammillaria elegans, Mammillaria uncinata, Mammillaria hubertmulleri, Stenocereus dumortieri, Stenocereus stellatus, Stenocereus beneckei, Opuntia pumila, Opuntia tomentosa, Myrtillocactus geometrizans and the palm Brahea dulcis. 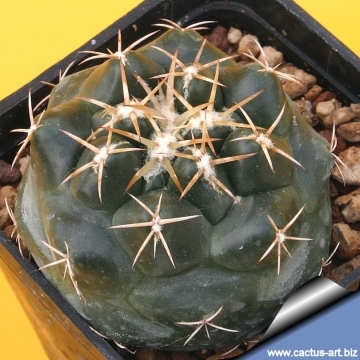 Description: Coryphantha elephantidens is a large, depressed-globular cactus, simple or occasionally clumping and group-forming. C. elephantidens usually has pink flowers but they can sometimes be yellow. This species comprises three subspecies - the typical form, subsp. bumamma (Ehrenb.) Dicht & A.Lüthy, and subsp. greenwoodii (Bravo) Dicht & A.Lüthy. Derivation of specific name: The epithet 'elephantidens' comes from Latin and means 'elephant tooth' and describes the fang-like spines of this species. Stems: Simple, flattened globular to subglobose, up to 14(-19) cm in diameter and 14 cm high, glossy dark green, subglaucous. Tubercles; Very large, , somewhat flattened, 20-30 (60) mm wide, obtuse, rounded on top, pentaedrical at the base, 4 to 5 cm wide, always broader than rounded, without glands, the tubercles axil is densely woolly. Areoles: Elliptic, when young woolly, in age naked. Spines: The tubercles are capped with a 5-8 of stout reflexed radial spines, spreading, somewhat unequal, 18-26 mm long, strong, subulate, curved, never porrect, but adpressed to the body, when young brownish with yellowish bases, black at apex. Central spines are absent. Flowers: Sweet smelling large 6 to 11 cm whitish broad, perianth-segments numerous, narrowly oblong, apiculate rose-colored to purple pink or white with a reddish throat and reddish median strip, (rarely yellow). Blooming season:: Late summer to autumn. Fruits: Very big, ca. 4 cm long and 1 cm in diameter. Notes: Coryphantha elephantidens is the centre of a complex of closely related species and it is quite difficult to decide about what is the valid names or eventual subspecies of the different taxon at present time. 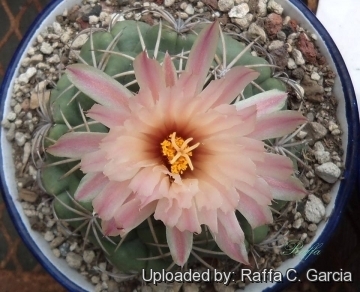 The complex comprises: Coryphantha elephantidens (Lemaire 1838) Lemaire 1868 Coryphantha sulcolanata (Lemaire 1838) Lemaire 1868, Coryphantha recurvispina (De Vriese 1839) Bremer 1976 Coryphantha bumamma (Ehrenberg 1849) Britton & Rose 1923 Coryphantha greenwoodii Bravo 1970 and Coryphantha garessii Bremer 1980. 4) Hernández, H.M., Gómez-Hinostrosa, C., Guadalupe Martínez, J., Sánchez , E., Dicht, R.F. & Lüthy, A.D. 2013. Coryphantha elephantidens. In: IUCN 2013. "IUCN Red List of Threatened Species." Version 2013.2. <www.iucnredlist.org>. Downloaded on 17 February 2014. 10) Charles Antoine Lemaire “Cactearum aliquot novarum ac insuetarum in Horto monvilliano cultarum accurata descriptio.” 1838. Cultivation and Propagation: Full sun to light shade in summer. Water sparingly, keep drier in winter. Needs good drainage. Frost Tolerance: Hardy to -3°C. Propagation:: Offsets as it is a suckering cactus or by seeds.